Join us for a “Hawaiian night” with upscale luau buffet and largest cast show in Waikiki! 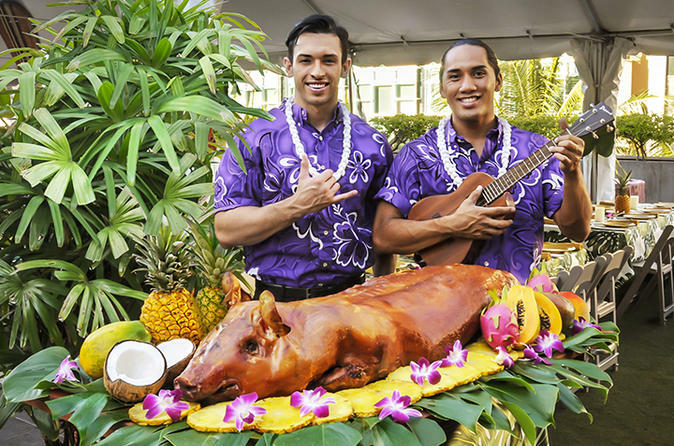 You’ll enjoy roasted luau pig and beef buffet, welcome Mai Tai, live Hawaiian music and hula before being seated in the premier section for the new “Rock-A-Hula!” After the show, don’t miss the exciting Meet-and-Greet with Legends Artists. Skip the long drive and enjoy Hawaiian Luau buffet in the heart of Waikiki. Start your evening with a Hawaiian Greeting where whole fresh Maui Gold Pineapple awaits you at your table (served family style) and strolling musician provides relaxing live Hawaiian music. Hula dancers will entertain during dinner and give a simple hula lesson. One Original E Komo Mai Tai is included. Also enjoy cocktails at the Treetop Terrace or at one of our fabulous bars and lounges. Socialize, browse through the Legends Room with authentic memorabilia, and get ready for the show! Savor the flavors of upscale Luau Buffet featuring welcome chilled Pineapple; Carving Station with Whole Roasted Luau Pig and Herb Crusted Roast Beef; Hulihuli Chicken; Pacific White Fish with coconut curry sauce; Lomilomi Salmon; Hawaiian Greens Medley*; Island-Style Macaroni Salad; Long Rice Salad*; Tofu Poke*; Duo of Sweet Potatoes*; Hawaiian Sweets Sampler of Desserts; and much more. Served with Taro roll, sweet butter, Kona Blend coffee and tea. Special vegan selections are marked with *. Grilled vegan garden patty also available with 24 hours notice. Enjoy Premier Seats in the center section of the mezzanine for the show. The new "Rock-A-Hula" show is Waikiki's largest cast, concert quality show featuring powerful Hawaiian and Polynesian music, hula and fire-knife dancing, alongside the greatest rock 'n roll performances of superstars past and present at the 750-seat multimillion-dollar Royal Hawaiian Theater®. Finish the night with Legends in Concert original, Meet-and-Greet where you'll have exciting and engaging opportunity to get autographs, take photos and chat with the Legends Artists and dancers.